Love the cooler seasons? Got £4 to spend and want a Winter ready eyeshadow palette? Well look no further. "MUA Makeup Academy has announced the launch of its Winter Forest Palette for autumn. The palette comprises 10 matte eyeshadow shades that have been created to encapsulate the cooler tones of the season, with jewel tones to natural and earthy shades." It will cost £4 and launch on the 27th of August. Christmas isn't far off so with that in mind here is a super, deluxe hair care gift idea! 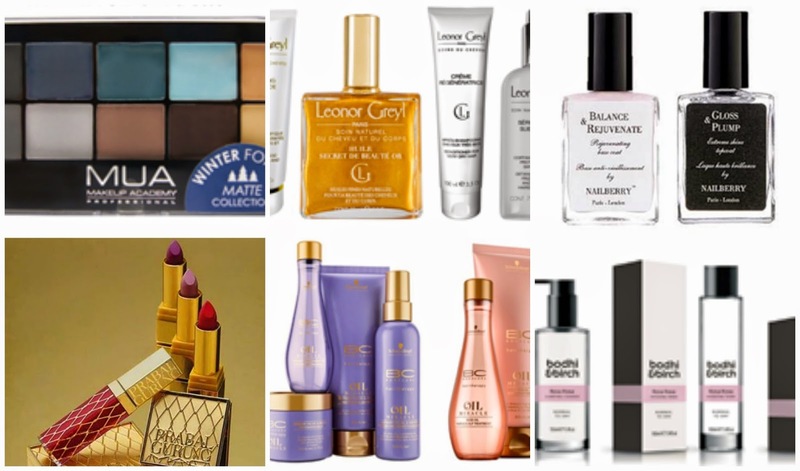 "Haircare brand Leonor Greyl has announced the launch of Luxury Parisian Coffret Gift Box for Christmas. The gift contains four hair products, as well as a complimentary mini dose of Huille de Leonor Greyl and hair comb. Products include: Shampooing Revivissence, a shampoo for colour damaged and brittle hair to revive and rehydrate;Huile Secret de Beauté Gold Limited Edition, an oil for both body and hair which moisturises deeply, protects and restores, while including golden glitter particles to add shimmer; Créme Régénérative, a protective conditioning cream for dry hair and split ends; and Sérum de Soie Sublimateur, with added silk proteins for smooth hair and increased flexibility protection, nourishment and manageability." It will cots £120 and launch this coming November. One for nail fans "Nailcare brand Nailberry has announced the launch of Balance & Rejuvenate base coat and Gloss & Plump Up The Volume. The new base coat offers a moisturising layer, ideal for thin, soft and brittle nails. The added plant extracts and bespoke formula helps to even out rides and leaves nails feeling supple, smooth and strong. The added UV filter helps to protect against discolouration and yellowing nails. Gloss & Plump Up The Volume top coat has been developed to quickly achieve crystal clear, gel like nails with a wet-look shine. The product builds instant volume on coloured polish and also includes the added UV filter." Again this is a September launch and will cost £13.50. I have already mentioned the upcoming MAC Prabal Gurung Collection for the festive season but thanks to WWD we got a sneak peak at the packaging today. I have to say I am not as much of a fan as I thought I would be. It has a vintage yet slightly tacky feel. I will refrain from proper judgement until more press images and information is launched but for me it is a skip. A brand I am a huge fan of and more agreeable on the old purse strings! "Schwarzkopf Professional has announced the launch of its BC Oil Miracle Barbary Fig Oil collection, the latest addition to the BC Oil Miracle range. The new range combines micro-keratin and Barbary fig oil to provide hair with the weightless care of oils to deeply repair and regenerate dry and damaged hair. Products include: Restorative Treatment, to smooth, nourish and replenish dry, dull or damaged hair without weighing the hair down; Restorative Shampoo, offering an intense replenishment for strong, shiny and soft hair; Restorative Conditioning Milk, a rich spray oil which nourishes dry and damaged hair for improved resilience, manageability and softness; andRestorative Mask, a buttery rich texture for instant strength, resilience and smoothness. For an extra boost, the Ultimate Restorative Ritual is an in-salon only service to restore condition and rehydrate dull, dry and damaged hair. The brand has also unveiled its new BC Oil Miracle Rose collection, infusing Rose Oil technology to nourish hair while pampering and conditioning the scalp. The range comprises: Hair & Scalp Treatment, to help soothe and alleviate any tautness and dryness, as well as protecting against heat; and Hair & Scalp Shampoo, a rose-tinted shampoo with precious rose oil to cleanse and deeply moisturise. "This will launch this coming September and cost between £11.75-£19.95. A new skin care launch this week! "Skincare brand Bodhi & Birch has announced the launch of Rosa Rosa, a new trio of products to purify and maintain skin health, restoring its natural vitality. Rosa Rosa features a three step system including the Clarifying Cleanser, Hydrating Toner and Daily Moisturiser, optimised for normal to dry skin types, including sensitive. Products have been designed to combat dull looking skin, aiming to smooth, tone, brighten and even out the complexion leaving a rejuvenated and vibrant glow. The Rosa Rosa collection features a blend of Bulgarian damask rose otto, Tunisian neroli and Roman camomile, capturing the florals of blush rose and orange blossom. The range is also available as an introductory skincare set." Have a lovely evening and weekend for that matter! Oh my goodness, that MAC packaging is GORGEOUS! That MAC packaging looks so luxurious! I may have to pick up a product or two from the collection. Awesome post as always Adrienne! Woah didn't even recognise that as MAC, definitely looks like an interesting one! Love that MUA are doing another matte palette too. Really looking forward for the MAC collection. I actually love the look of the MAC collection, it's the vintage tacky look that makes me want everything!